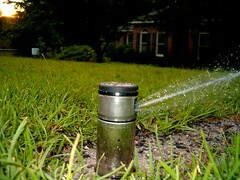 Watering by hand with hoses is OK, but the use of sprinkler systems and irrigation systems is now under mandatory ban in North Reading due to the water crisis. Our supply from Andover has been cut due to their own water crisis, so simply purchasing more water is not an option. Our water Supt. Mark Clark thanks everyone for their cooperation. Water levels in Martin’s Pond have not been this low (74.1 feet above sea level) for many years. Pond levels are usually about a foot higher, even in summer. Our “normal levels” are about 74.8-75.2 year round. The pond water is high in nutrients, good for watering plants instead of using tap.